Today we are going to give you some of the basic rules on how to play the casino game of Roulette. When you attend a Casino Party or FundRaiser in Buffalo, Rochester or anywhere in New York this will give you some insight on this popular casino game. The rules in a regular casino may vary slightly from the Fantasy Vegas Casino Parties in Buffalo and WNY. The object of Roulette is to pick the winning number that will appear on the Roulette wheel. You can also bet combinations of numbers or choose the color or whether it is odd or even. Although it may look easy...It is not as easy as it seems. There are two different roulette wheels. The European wheel has 37 slots numbered 0-36. The American wheel has 38 numbers which includes zero (0) and double zero (00). The American Wheel is the one Uptown Entertainment offers for our Casino Parties in Buffalo and throught the North East. The Roulette Table at Uptown Casino Parties use special roulette chips when you play. To avoid disputes each player receives different color chips. These chips are good for that table only and you must trade them in when you get done playing. You will them be given regular casino chips to take to the the other Uptown casino tables. 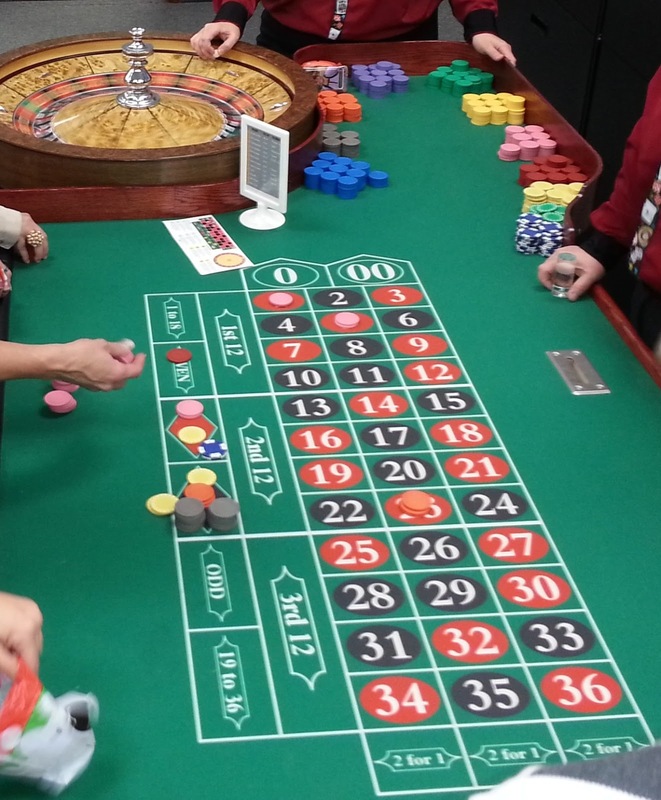 Typically each roulette table will have a minimum and maximum bet. You can’t combine your inside and outside bets to meet the table minimum in the regular casino. This rule varies with a Fantasy casino, but typically If the minimum bet is five play dollars you have to bet five play dollars on the inside and five play dollars on the outside. There are several inside bets that you can make. You can bet a number straight up or straddle the line between numbers to select a combination of numbers. The payouts for each bet are as follows. Straight Up bet is a wager on a single number which pays 35 to 1. Street bets or line bet and it pays 11 to 1. You make this bet by placing your chip on the vertical line separating the outside and inside betting areas. The chip straddles the first number in the row. Basket bet is a five number bet on zero – double zero and numbers-1-2-3 which pays 6 to 1. On the double zero wheel this is the worst bet in Roulette. Red Black Odd and Even are all even money bets. You place your chips in the boxes on the layout. Dozens bet are made on the 12 consecutive numbers. You place your wager in the boxes marked 1-12, 13-24 or 25-36. These bets pay 2 to 1. If the zero or double zero comes up you lose. Column bets are also 12 number bets. Instead of 12 consecutive numbers they consist of the numbers in one of the three vertical columns and are made in the boxes at the bottom of the layout. These bets pay 2 to 1 as well. The Uptown Roulette Dealer will assist you on the table and help with placing your wagers. Dealers are required to keep the wheel moving at all times, even between spins. The dealer will spin the ball in the opposite direction of the wheel. This causes the ball to jump and spin before landing on a number. Roulette has a high house edge but it is Fun to learn and actually quite easy to play.If the number you want to bet is already covered with chips, that's not a problem. It is permissible to stack you chips on top of the other chips. This is another reason why each player has their own color chips.You are allowed to place bets after the dealer spins the ball. The dealer will tell you when to stop. As the ball slows down the dealer will wave their hand over the table and call out “No More Bets.”Some people claim that they have a sure fire system for winning at Roulette. The truth is there is no system that will change the house edge. 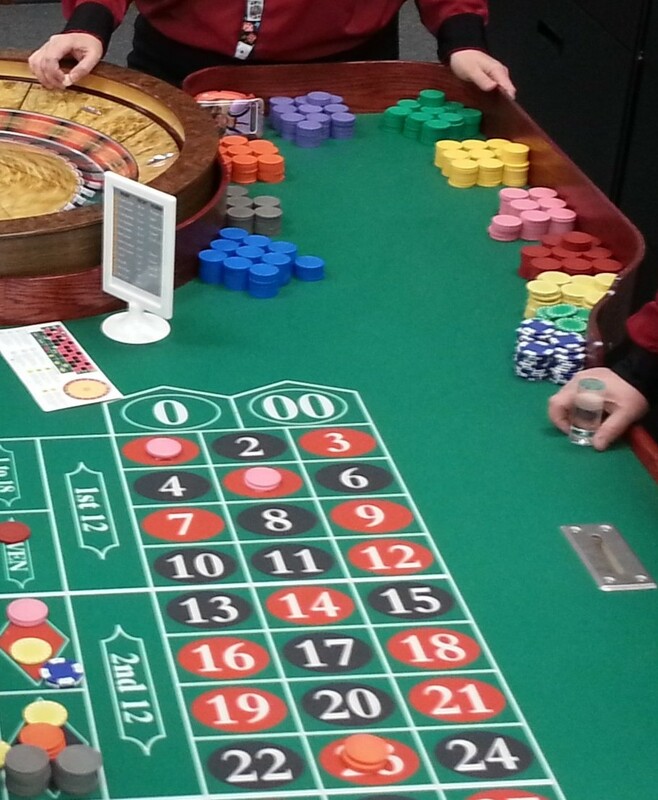 Now It's Time to have a little FUN and jump on the Roulette table whenever you attend a Fantasy Casino Party or FundRaiser in Buffalo, Rochester or anywhere in Western New York. Uptown has been bringing a "Touch of Vegas" to our clients for over two decades. We are Fully Insured and our Entertainment Specialists are waiting to help you plan a successful Casino Party! We look forward to seeing you at one of our events in the near future!